This is the second part of a series of posts about my recent weekend trip to Donsol, Sorsogon for the Whaleshark experience. Budget for this Donsol trip is available for download. This wasn’t the first time I’ve been to Donsol. The last time we went home to my parent’s hometown, my dad decided to have a road trip around Bicol and see various towns. One of them was Donsol. I remember that long drive from Bulusan to Donsol. It’s weird having to pass through Legaspi first before heading back to Sorsogon. It was a long and winding road up and down the mountains. Like most drives in the Bicol region, this is really nothing new. I remember the roads being smooth in some areas, and unpaved in some. Back in 2002, they were just starting to promote the Butanding experience. Going back in 2008, I was able to recognize some of the landmarks we saw during our previous trip. Unlike before when the roads weren’t totally paved yet, the road to Donsol was smooth concrete, stopping just past the Tourist Centre. And unlike before when we literally just stopped to look at the sea, this time I’m going out to sea. Another landmark I recognized was the resort we went to before. I never did remember the name, but I remembered how it looked like. It turns out that Amor Farm Beach Resort was the same resort we went to five years ago. The paper mache butanding was gone, and so was the purple potted sili plant, but the basketball court was still there. Right then and there, I felt at home. This is Bicol, after all. 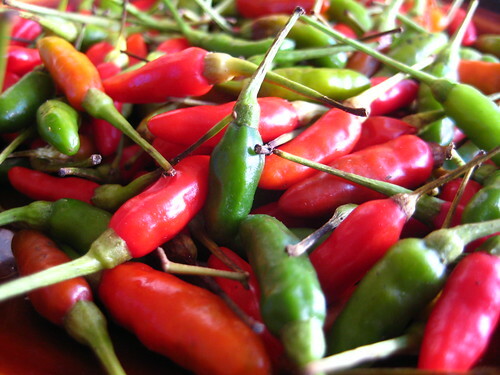 Welcome to red hot Bicol. There was this guy who ordered a bowl of pancit and specifically asked the girl behind the counter to put in 5 pieces of sili. I can’t even imagine eating one, let alone 5! We arrived late in the afternoon, just in time to sign up for a Firefly tour. The firefly tour is basically just a boat ride up the river to gawk at the fireflies. One boat can hold up to 5 passengers (excluding the boatmen), and costs Php1,100 per boat (depending on the resort). Agnes, our contact person, told us that there are three guests who are joining the tour. Would we like to join them to complete the 5? Owen and I jumped on this opportunity, since it can get pretty expensive if it was just the two of us. I wasn’t really expecting much from the tour. I was looking forward more to the opportunity to relax, away from the noise and the lights of the city. We went out just after sundown and it was pitch black when we got to the river. As we puttered up the river, one or two fireflies whizzed past out heads. I was thinking there would just be fireflies flying around us, and that would be it. I never expected that there would be hundreds of them congregated in the trees around the river. This is what’s missing in Australia. 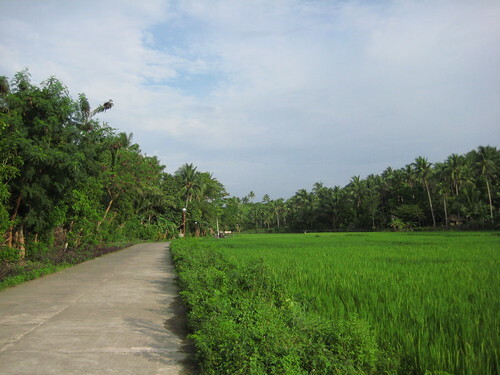 Rice paddies and coconut trees. There were green areas in Australia, but their green is dull, unlike this vibrant green the Philippines had. It was an amazing sight. The tree looked like it was covered in hundreds of twinkling fairy lights. And it wasn’t just one tree, there were several. After several minutes staring in awe at this spectacular display, we headed back to Amor, just in time for dinner. We had dinner with Tanja, a German on her last leg of her 5 month South East Asian trip. We talked about places we’ve been to and places we want to go to. It was great to be talking to people who have the same passion for traveling as I do. We adjourned at 11pm, because the staff were closing the restaurant. Besides, we have an early morning the following day. Hello! I’m the owner of http://www.journeyetc.com/ and was wondering if we can do a link exchange! I currently have PR4 and 350 uv/day (quickly rising). I’m still new in the travel, but i’m only 16 so I have plenty of time to develop my blog! Please get back to me, it’s very important for me! Donsol is indeed the whaleshark capital of the Phil., or even the whole world. I’m a tour guide here in Donsol..
97% of my guests, foreign and local have seen these gentle giants.. also, the firefly watching and the island hopping in the scattered islands of Masbate..
To all who wish to come and visit us…contact via mail or phone..
whaleshark interaction is an experience of a life time. Swimming with the living prehistoric-life creature in world is an overwhelming experience. As one of the senior Butanding Interaction Officers, i can attest that in my 11 years of experience, swimming with my guests from different nationalities and culture. That experience can be yours too. Guests can contact me for donsol butanding tours. I wish to invite tourists from around the world to come and visit our Gentle Giants, the Whaleshark or Butanding in our dialect. Our Butanding interaction here in Donsol, Sorsogon, Philippines is dubbed as the, “Best Animal Encounter in Asia”. Im a travel agent and the Manager of Donsol Aqua Tours and Services. I will make sure that everyone who will come and visit will left with a smile and excitement with their adventure here in the Philippines especially here in our town, Donsol, the home of the Whalesharks. One can contact me via Email, takz78@yahoo.com with a number 63+921-743-5677. 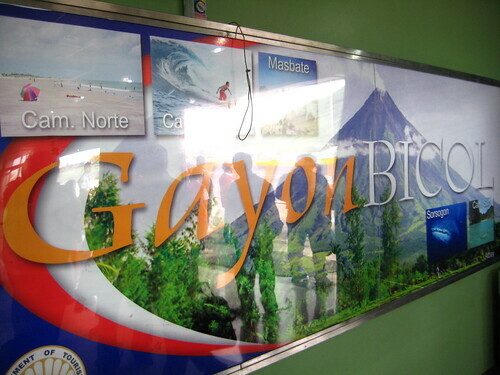 Come and visit our town, VISIT PHILIPPINES, THE PEARL OF THE ORIENT…. I wish to invite you to be a member of the Whaleshark Donsol Travellers, a social network for those people who have already interacted with our whaleshark here in Donsol and also for those who wish to come here in Donsol. The website is http://www.whalesharkdonsoltravellers.ning.com. You can share your experience, comments and quires about how the tourism in Donsol works. I am Joel Briones. As the new Vice-President of Donsol Butanding Interaction Officers, I would like to invite everybody to come and visit Donsol to swim with our Whalesharks. Again i would like to invite people from around the world to visit us and snorkel with our gentle giants..
For tour inquiries email me takz78@yahoo.com or call me #63+921-743-5677..
No question that our Butanding is the best animal encounter in Asia, not just by Time Magazine but from the chronicles from the thousands that visited our town. Even for us locals, we are fascinated every time we swim with our Giants. We have difficulty last year. The sightings are poor. So far today, the new administration put in place several restrictions not to scare our Butanding. Very hard for us to pinpoint the cause of its decline.. So far today we are optimistic, the sightings are pretty good compared last year. 70 to 80% of chance to see the Sharks. For more info about our sightings and everything here in town..